During the process of designing a luxury kitchen, Artichoke’s design team will almost always allow for a large kitchen island. In the 25 years that we have been designing bespoke kitchens for clients, we’ve never designed the same island twice. Islands will usually sit in a commanding position centrally within the kitchen space and they are therefore the first item of furniture that client’s like to focus on during the design process. They have a large impact on a room and are usually the first piece of furniture that visitors see when they enter, so they should be designed with care and attention to detail. The design direction for a kitchen island depends on a number of key factors. First and foremost, is the kitchen island there to impress or do you want it to have a practical function? When designing the large kitchen island in the image below, attention was primarily focussed on drama. 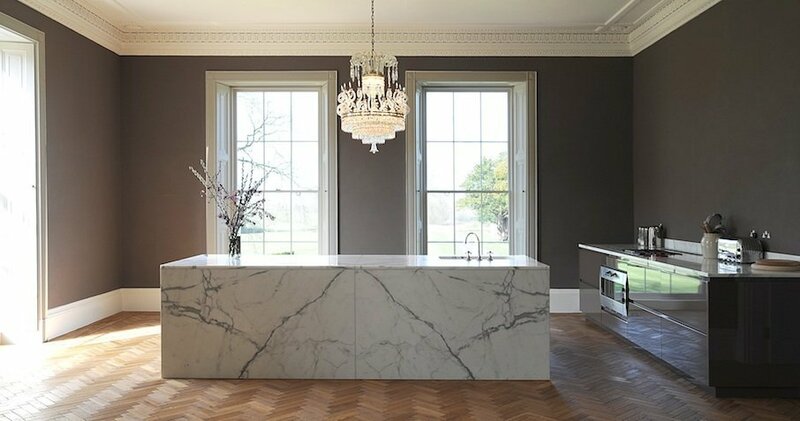 The contemporary bookmatched marble island offsets the regency sash windows perfectly. A large island in a regency house in Somerset designed by Artichoke in conjunction with interior designer Ilse Crawford. When pressed with the question of form over function, many clients are tempted to want both, but in our experience asking for both a dramatic and functional island simply serves to dilute both in equal measure; if you can, choose one, and pursue it whole-heartedly. In the kitchen island below, care was taken to be far more subtle in the design process. This is a working kitchen for a London house, and as such the luxury of drama was over ridden by the need for a large practical island that functions well as a working kitchen space. The drama was introduced over the island with the large batterie-de-cuisine and striking industrial extractor hood behind. This more practical and subtle island takes a more discreet approach. Artichoke regularly designs kitchens for professional and semi professional cooks where function usually takes precedent over form. The large cook’s kitchen island below is one such commission. The worktop is divided in two, with basalt forming the main surface at one end of the island for more heavy duty food preparation such as washing vegetables, peeling, chopping etc, with a softer material, oak, at the other end for baking and pastries. Aesthetically this large kitchen island takes on the feel of an Edwardian Cook’s table. 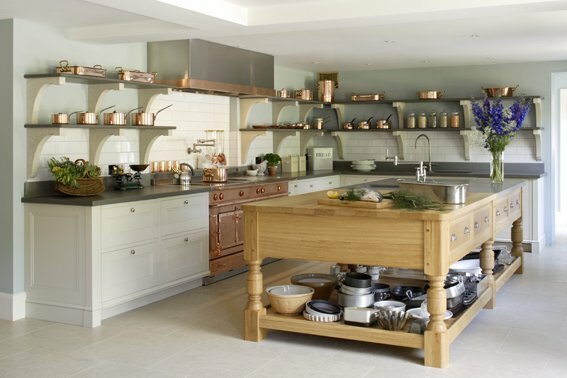 A kitchen island designed by Artichoke inspired by an Edwardian cook’s kitchen. 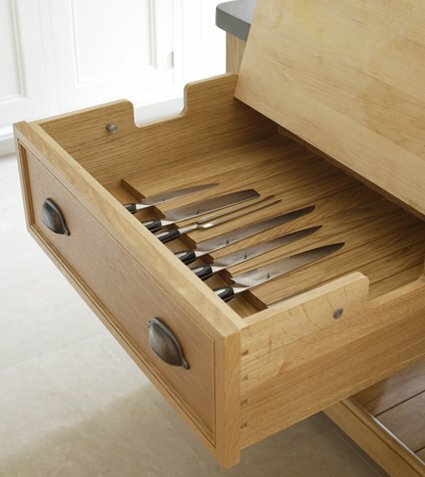 Chef’s knives are stored in this large kitchen island.Occasionally, Artichoke will be asked to include more than one island in the design. In this instance it is first important to consider whether multiple islands are actually needed. In our experience having more than one island can result in one becoming a dumping ground for daily administration, keys, post and other items not considered essential to a kitchen. However, in some cases two may be the right decision for the space, and the project pictured below is a great example of this. 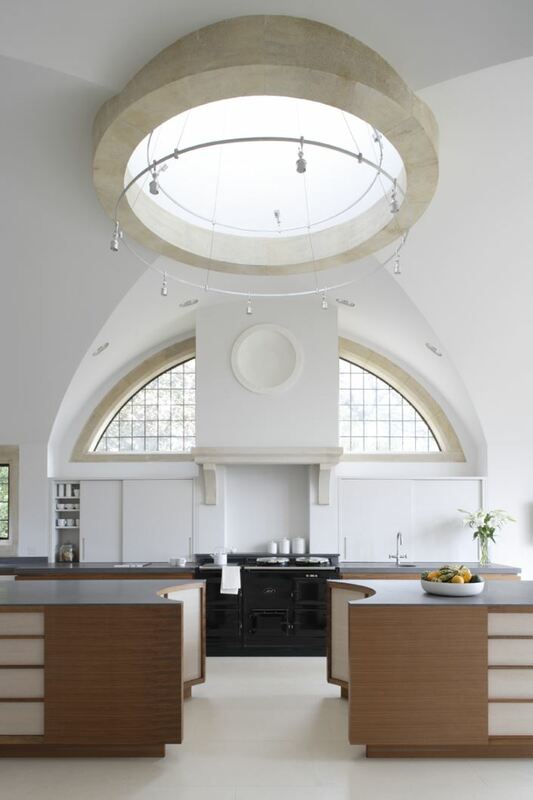 Artichoke designed two kitchen islands to aesthetically complement the over hanging roof lantern; the circle forming the centre of the islands matches the shape of the roof lantern above. In this case, having two islands also improved the flow of the space and was the preferred option over one large kitchen island for the client to walk around. The shape of these two islands reflects the roof lantern above. The final option is to create a large kitchen island from a single appliance, as in this kitchen designed by Artichoke for an Art Deco inspired house in London. This option limits typical uses for a kitchen island as there is often little preparation space, but with the correct appliance, such as a La Cornue in this instance, it can look very striking. 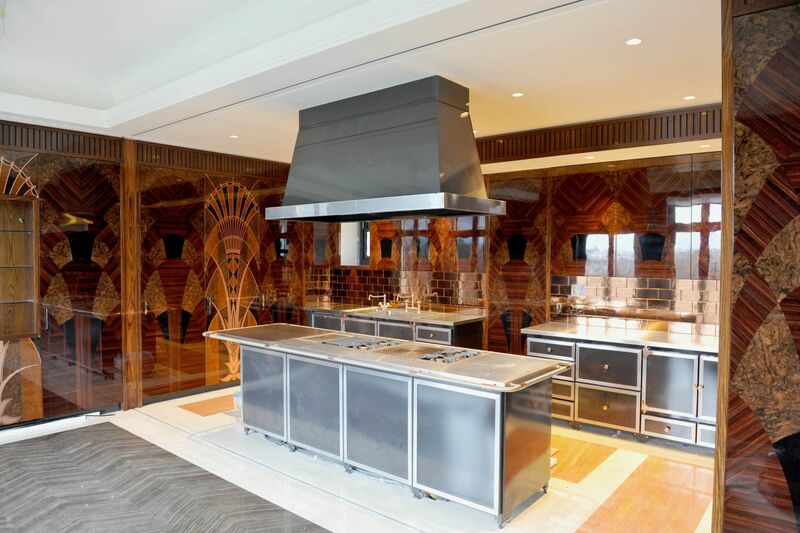 A La Cornue forms the large island at the centre of this Art Deco inspired kitchen. Our portfolio contains further images of large kitchen islands. If you have a design project you’d like to discuss, please call +44 (0)1934 745270.